Dr. Rafferty: Breast tomosynthesis has been approved for mammographic screening in the United States for just over 5 years, and many single center studies have demonstrated its improved performance for screening outcomes over digital mammography alone. Our previously published multi-center analysis, (JAMA 2014;311(24), the largest study on this topic to date, demonstrated significantly improved cancer detection and reduced recall rates for women undergoing tomosynthesis compared with digital mammography alone. In the current issue of JAMA we evaluate the differential screening performance after implementation of breast tomosynthesis as a function of breast density. While tomosynthesis continues to be increasingly available, questions remained about which women should be imaged with this technique. In particular, does this technology offer additional benefit for all women, or only for women with dense breasts. The size of the database compiled by the centers participating in this study allowed us to evaluate this important question. The most critical finding of our study was that the use of tomosynthesis for breast cancer screening significantly improved invasive cancer detection rates while simultaneously significantly reducing recall rates both for women with dense and non-dense breast tissue. Having said that, the magnitude of the benefit was largest for women with heterogeneously dense breast tissue; for this population, tomosynthesis increased the detection of invasive cancers by 50% while simultaneously reducing the recall rate by 14%. Dr. Rafferty: Clinicians and patients should know that the data is clear that screening mammography saves lives, and over the years patient outcomes have improved as we improved our imaging techniques. 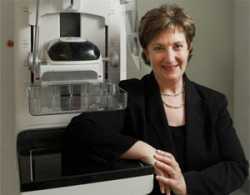 Tomosynthesis now represents the state of the art in mammography technology. As a clinician recommending a mammogram for your patient or as a woman choosing a mammogram for yourself, optimally you would want the mammogram with the best performance–today that is breast tomosynthesis. Our paper published this week in JAMA adds compelling evidence that the improved performance outcomes achieved with tomosynthesis are seen in both women with dense and non-dense breast tissue. Dr. Rafferty: The addition of tomosynthesis significantly improves mammographic performance, most substantially for women with dense breasts. Future research could focus on whether supplemental screening with other modalities such as ultrasound or MRI offer additional gains, and if so, for what specific populations. This information would allow us to better guide women in their decisions regarding the optimal screening regimen for them. Dr. Rafferty: Mammography saves lives; it is the only breast cancer screening tool that has met that standard. This entry was posted in Author Interviews, Breast Cancer, JAMA, Mammograms and tagged breast cancer, mammography by Marie Benz MD FAAD. Bookmark the permalink.